Canker sores can be a real pain, and are sometimes tough to heal. 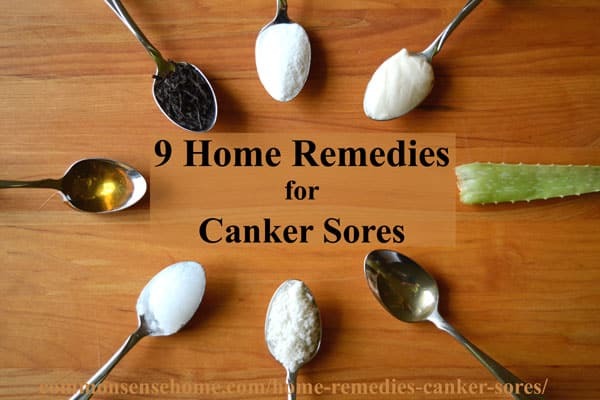 In this post we'll give a quick overview of the different types of canker sores, what causes canker sores, the difference between canker sores and cold sores, and some inexpensive home remedies for canker sores. Hopefully if you've come here for canker sore pain relief and prevention, we've got on option that will get you back on track ASAP. What is a Canker Sore? 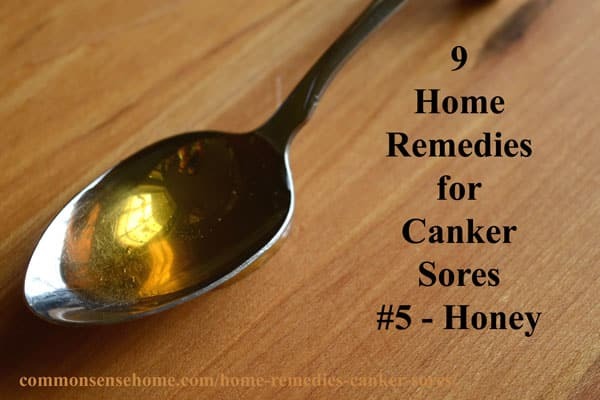 Simple canker sores. These may appear three or four times a year and last up to a week. They typically occur in people between 10 and 20 years of age. Complex canker sores. These are less common and occur more often in people who have previously had them. The exact cause of most canker sores is unknown. Stress or tissue injury is thought to be the cause of simple canker sores. Certain foods – including citrus or acidic fruits and vegetables (such as lemons, oranges, pineapples, apples, figs, tomatoes, and strawberries) – can trigger a canker sore or make the problem worse. Sometimes a sharp tooth surface or dental appliance, such as braces or ill-fitting dentures, might also trigger canker sores. Some cases of complex canker sores are caused by an underlying health condition, such as an impaired immune system; nutritional problems, such as vitamin B-12, zinc, folic acid, or iron deficiency; and gastrointestinal tract disease, such as Celiac disease and Crohn’s disease. Can you Prevent Canker Sores? 3. Brushing with a soft-bristled brush after meals and flossing daily, which will keep your mouth free of foods that might trigger a sore. So, if you have frequently occurring canker sores, you should probably take a look at your health/diet to see what the underlying factors might be. What's the difference between canker sores and cold sores? Cold sores are a cluster of blisters that first appear clear then become cloudy. First infection may be inside the mouth, but cold sores generally appear outside the mouth on the lips. Canker sores are gray or white sores surrounded by a red inflamed area. They occur only inside the mouth, on the tongue or the insides of the cheeks, lips or throat. Cold sores (also known as fever blisters) are caused by a virus, herpes simplex virus (HSV), and may be transmitted via contact, especially when the sore is open. The cause of canker sores is unknown, and they are generally not considered to be transmittable. I rarely get canker sores, but the last one I had was inside my lower lip. The little blister was annoying – red, sore and constantly rubbing against my teeth. The bump wasn’t huge, maybe 2 mm across. Since I was taking my tablespoon of coconut oil before breakfast, lunch and dinner anyway, I decided to hold the oil in the front of my mouth as long as possible as it dissolved. After breakfast, the day got busy as usual and I didn’t really have time to focus on the canker sore. It wasn’t until around 4:30 in the afternoon when I was talking to my sister on the phone that I realized the bump was GONE. Nada, zip, zilch. I went and looked in the mirror and all that was left was a red spot and a slight indentation. By the next morning even that was mostly gone. The area was just a wee bit darker then the surrounding tissue. I NEVER healed a canker sore that fast. I’ve tried over the counter remedies, alum, ice cubes – nothing has worked this fast or this painlessly. Coconut oil has also been used to treat warts. Get my favorite coconut oil here. Baking soda is the #4 recommended remedy on EarthClinic for canker sores. 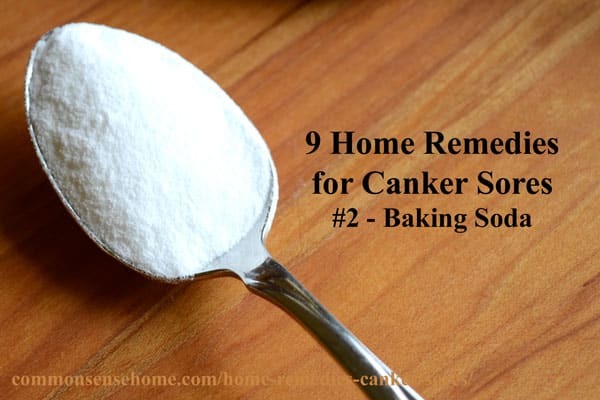 Users have treated canker sores by dissolving baking soda in water and holding it in their mouths, and by applying baking soda directly to the canker sore. Here is some feedback from EarthClinic users on baking soda. Baking soda cured my canker sore within 24 hours. The canker sore on the side of my tongue was so sore I couldn't hardly swallow. I took 1tsp of baking soda and 1 tsp of water and kept it in my mouth as long as possible. 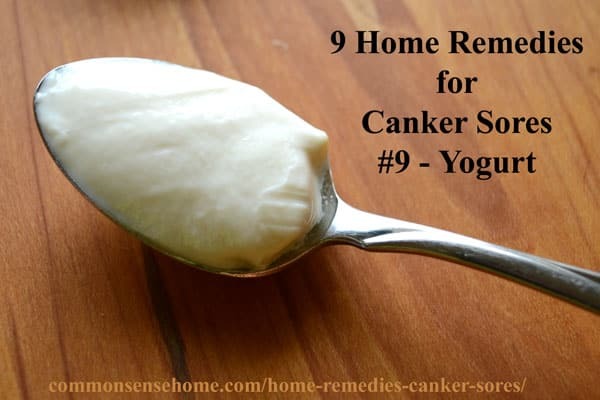 I did this 3 times within an hour went to bed and did the same the next morning by dinner time the canker sore was gone! Out of the blue 4 days ago I got a canker sore that was 1.5 inches large on the side of my tongue. It was excruciating! Last night before bed I tried putting a baking soda paste on it and I woke up this morning and it's almost gone! Baking soda is also useful for treating bites and stings. 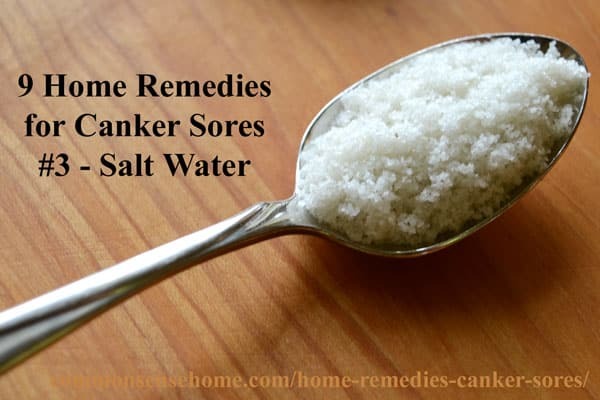 In the book “Home Remedies: What Works” (now out of print), a salt water rinse was one of the top canker sore remedies. Canker sore sufferers saw relief after swishing salt water around in their mouths for a few minutes 2-4 times per day. To use, dissolve two tablespoons of salt in a six ounce glass of warm water. Sip and swish gently over the affected area for several minutes, spit. Repeat as needed. The consulting doctor for the book says that salt water helps draw fluid through tissues, speeding healing. In just 4 days, all sores in the honey group had disappeared completely—but the number of sores in groups 2 and 3 hadn’t budged. Honey even helped to soothe pain. After day 1, honey users reported a 95.5% decrease in pain, with total pain elimination by day 2. Groups 2 and 3 were not so lucky: It took them 8 days to reach the same pain-free state. So – hit the pantry and thank the bees for sweet relief. You can swish food grade aloe vera gel around the mouth, apply it directly to the canker sore, and/or drink as a supplement to help speed healing of canker sores. Aloe vera contains salicylates, like aspirin, which reduce pain and inflammation. Aloe vera is also a natural antibiotic. You can purchase ready to go aloe vera juice, or make your own by juicing or scraping and mashing the pulp from an aloe vera leaf. L-lysine is an essential amino acid, which means it is required for health but can't be manufactured by the body. It's found in high protein foods like nuts, red meat, eggs, milk, cheese, beans, and sardines. It's also available as a supplement. Patients who have large wounds, burns, or other medical conditions involving protein loss also need supplemental lysine for repair. Some people take l-lysine supplements to treat or prevent viral infections like cold sores and shingles. Although lysine may be taken without prescription, it must be taken with caution to avoid side effects such as nausea, abdominal cramps, diarrhea, and stomach pain. For treating herpes (cold sore) infections, one may need a higher dosage, ranging from 3,000 – 9,000 mg, taken in divided doses, daily. To prevent recurrences, one may need to take 1,000 mg three times a day. Consult a physician for more information on proper dosage and duration of intake. Excessive doses can also lead to gallstone formation and increased cholesterol and triglyceride levels. EarthClinic users have held l-lysine supplements on the canker sores for treatment. Others have dosed with 500 mg of l-lysine internally for canker sore treatment. Click here to buy L-lysine. Earth Clinic users recommend apple cider vinegar (ACV) either straight or mixed with warm water to help heal their canker sores. Mix Apple Cider Vinegar with a 1/2 cup of warm water and swish around in your mouth for 30-60 seconds, 2x a day. Your canker sore will disappear quickly! Other users held a spoonful of vinegar on the canker sore for 30 seconds to “as long as you can stand it”. 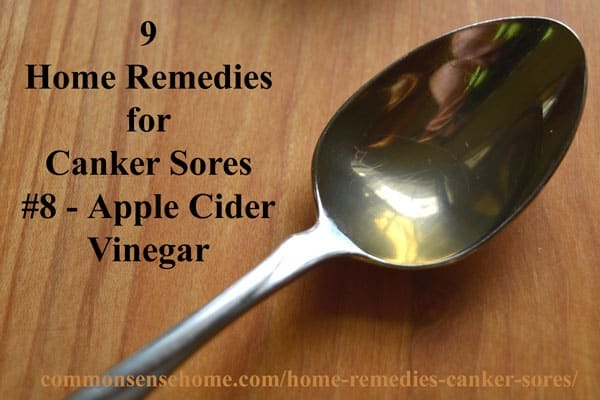 ACV is also recommended for sore muscles and headache relief. Note: Some users find their mouths are more irritated with ACV, so use with caution. Daily consumption of yogurt with live and active cultures may help prevent and heal canker sore outbreaks. According to Dr. Julian Whitaker, those who suffer from regular outbreaks should eat ¼ cup of yogurt per day for prevention, and consume an eight ounce container per day to heal an outbreak. Yogurt can also be used to treat acid reflux and sunburn. Although alum has long been used for canker sore treatment, I don't recommend it. Testing shows that the aluminum in alum can be absorbed through the skin, and I feel we have enough aluminum exposure in our lives already. Our readers on Facebook also recommended some remedies. I love coconut oil too! I will try out your tip next time I get a sore! I just swished with unrefined coconut oil for 5 minutes and the awful canker sore on the top of my tongue stopped stinging/hurting for the first time all day. The coconut oil also has relieved the pain of my inflamed gums and sensitive mouth. I oil pull regularly. It’s very good for gum health. Melissa – remind me to tell you another detox story…I may post it at some time if I have the friend's permission. A canker sore wouldn't surprise me at all. I found you on THL under Zinnada's blog question. I hope you visit me sometime. I am your newest follower. Joyful, thanks for stopping by. 🙂 I am super behind on posting, but eventually hope to be caught up. I still haven't gotten a chance to look through all the links from THL, but it's on my to-do list. I knew coconut oil was good, but I didn't know it was that good! You say it works for warts as well? I've got some stubborn plantar warts and I've tried everything to make them go away…Maybe I'll give coconut oil a go! Apple cider vinegar is one of the best remedies for plantar warts. I use it and recommend all the time. At the very least it shouldn't hurt, unlike when I had mine burned out years ago – ouch! The darn things grew back anyway, so I had to keep treating them for months afterwards. I've read that once your body recognizes them as a foreign body, it will cure itself, so I'm wondering if the very action of treating the wart and applying a known anti-fungal/anti-viral substance helps trigger that immune reaction? I’ve seen that cure mentioned on various sites, but haven’t tried it since we haven’t had warts. Good to know it worked. Thank you for this info. I suffer from them myself. I will be trying this. I hope it works as well for you as it did for me. 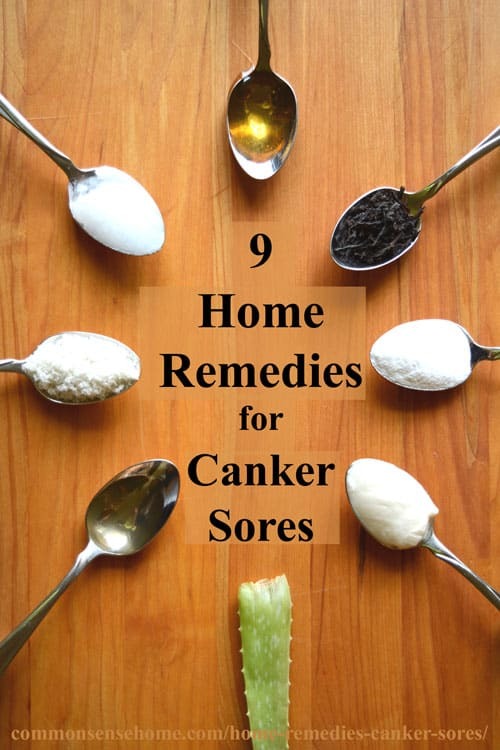 I stumbled across this site after looking up canker sore remedies for my husband. Luckily, I just happened to have a bottle of coconut oil in the cupboard so we are trying it. I hope it works as well for him as it did for you. Not sure how long to ‘soak’ the sore but we’ll try it periodically throughout the day today and see what happens! Thank you! I hope it helps! If not, he can work through the other option. Manage that stress, too! You said there were two types of canker sores but only mentioned one type. What is the second type? 1. 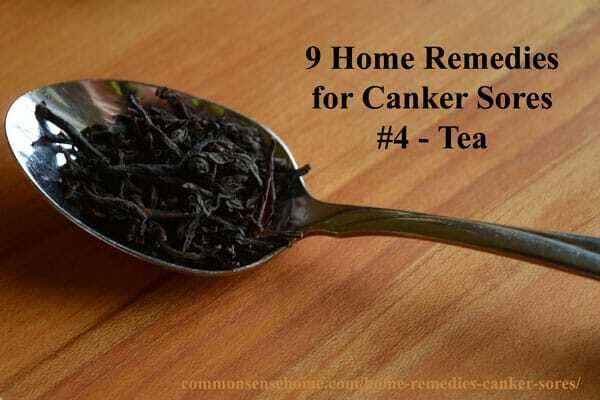 Simple canker sores. These may appear three or four times a year and last up to a week. They typically occur in people between 10 and 20 years of age. 2. Complex canker sores. These are less common and occur more often in people who have previously had them. 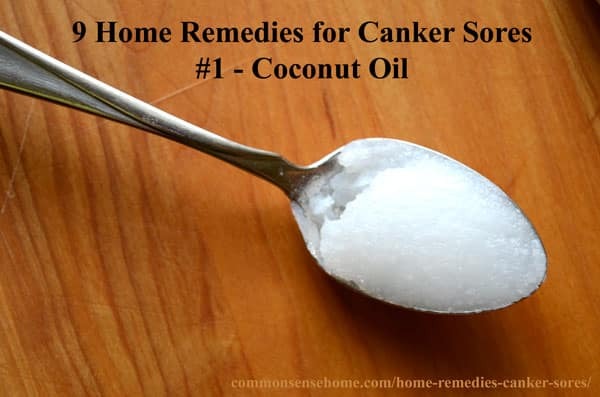 “The exact cause of most canker sores is unknown. Stress or tissue injury is thought to be the cause of simple canker sores. Certain foods – including citrus or acidic fruits and vegetables (such as lemons, oranges, pineapples, apples, figs, tomatoes, and strawberries) – can trigger a canker sore or make the problem worse. Sometimes a sharp tooth surface or dental appliance, such as braces or ill-fitting dentures, might also trigger canker sores. Leela – did you see the explanation in the comments? I’ll add it to the main post. I’ve dealt with canker sores (my dentist/doctor prefers me to use the proper term) as a result of an immune system issue. I’ve had them so numerous and so large (they’d merge and get bigger) that I couldn’t speak, eat, drink, without ripping them against my teeth and bleeding with my lips closed (think vampire after feeding). In a 2 year period I kept a log for my doc/DDS because they couldn’t believe it wasn’t just a few, it was hundreds, all in different stages of eruption, statis, and healing. It took a long time – less stress, less acidic foods/drinks, changing toothpaste/brushing more often, and increasing water intake to really lessen my occurrence to the point that I rarely have one. And that’s when I know I need to brush my teeth, have a lot of stress, or ate something that cut the inside of my mouth. Good to know that this would work too if I can’t keep it under control. Wow, Denise – that must have been so painful. I’m glad you found a way to keep them under control, and I hope they stay that way. I get sores in my mouth because of lupus and I read this (found through pinterest) about 2 weeks ago. I have since had an outbreak in my mouth and although they’re not completely gone, they are healing quicker and are less painful than ever before. (oops, should have said I have been using coconut oil). Thanks so, so, sooo much for this info!! Thanks so much for sharing your story, Laura. FYI! Because of the few meds I take for Fybromyagia I get dry mouth which has caused tooth decay. I started putting coconut oil on my toothbrush initially to reduce oral bacteria and help whiten my teeth and figured it was like a mini oil pull twice a day. To my surprise, it eliminated, well almost, my dry mouth. I ran out of coconut oil in my bathroom recently just as I was going on vacation and didn’t have a container handy that didn’t leak on a plane trip. I figured one week without wouldn’t be a big deal and I’d just refill my container when I got home. It has been a few extra days since I returned and my dry mouth has returned. My container is now refilled and I ready to go! I’ve always used bongela, over the counter medicine for my canker sores. It is not sold here anymore (live in an European country) due to some harmful ingredients. I wa so glad to find your blog with this tip. As I had some problems making the oil stay on the sore which is located far back on the upper part of the cheek, I took another scoop of oil with a teaspoon, molded it as I thought would fit the inside of my cheek and freezed it for few minutes. It made it last longer with out melting straight away and easier to make it stay in the right spot. The sore is already less painful! When I was young I got canker sores. I learned that a Qtip and rubbing alcohol really grinding it in there until it bleeds. They are gone after 2 days. I have not had one in at least 17 years. Even after I eat a bunch of tomatoes. Powder Alum works fast, within 24 hrs. Just wet your finger dip it and place it on the sore. Dries it up in less that a day. BUT it tastes terrible. or if you using powder try putting it in a cotton wool wad and holding it in place. Hemoform serum is one the best way to treat herpes. It also helps me to prevent cold sore when you use it at the very start of tingling sensation on the lip. If the cold sore appears, it cures the blister in a very short time. I love it! You should add alum to the list. It burns to put it on but the sore is gone within a day two at the most if it’s really bad. Pat one month ,I have this cranker sore problem..what is this the treatment. Or it is any other big problem in my body. Not sure I’m following your question. If you’ve had a sore that won’t heal for over a month, it may be a good idea to see a doctor as this could be a sign of a secondary infection. I would like to suggest alum powder also very effective just bear the pain. Just apply it directly on open canker sores. Me and my older sister using it to cure our canker sores. Thank you for taking time to share your experience. I had this ulcer/canker soar on my tounge and it hurt like you would not believe. Especially eating and even talking. Well I tried putting coconut oil and it worked. I am eating and it is way better than it was. I can’t promise it will work for you but it did for me. It is not 100% but it is way better than it was. One of the worst triggers of my canker sores as a kid was sodium laurel sulfate in toothpaste. When I switched, my canker sores went from a few a month to one or two a year. Definitely worth a shot for those who get them often. Thanks for sharing your experience, Ruth. Any kind of coconut oil should work, but virgin coconut oil tends to be more pleasant to hold in your mouth, and likely retains more anti-microbial qualities. Anything that will ease and help heal a cold sore more quickly? I understand that’s a different animal, but healing the skin around the lips shouldn’t be more difficult than in the mouth, surely… maybe some of these remedies would work? Cold sores are viral in nature, so any type of antiviral may help. One remedy that’s commonly used for cold sores is L-lysine (sometimes listed as Lysine), which you can find in an ointment or tablet form. One tablet listed on amazon is Quantum Health Super Lysine+ Tablets, Immune Support, Lip Care Supplement – L-Lysine (1500 mg), Vitamin C, Propolis, Garlic Bulb, Echinacea. As noted, it includes more than just the L-Lysine for immune boosting. Basic Organics L-Lysine Lip Ointment is well rated will quite a few positive reviews (that don’t look fake).